GrabHitch is a social ride-sharing platform that allows anyone with a car to pick-up and drop-off people going the same way in exchange for a fee. As a GrabHitch driver, you don’t have to be a commercial driver. You choose your passengers so you don’t have to go out of your way to pick people and you are free to provide hitch rides as and when it is convenient for you. If you’re in a hurry you can always Hitch another day- there’s no minimum driving requirement! Recover petrol costs with GrabHitch through the fees that you earn just by picking someone up when you are on your way to a meeting. And who knows, the next passenger that you pick up might even be your next potential client! This incentive is only eligible for new drivers who sign up and successfully complete 1 Hitch ride as a driver between 1st December 2016 @ 00:00 hours – 31st December 2016 @ 23:59 hours. 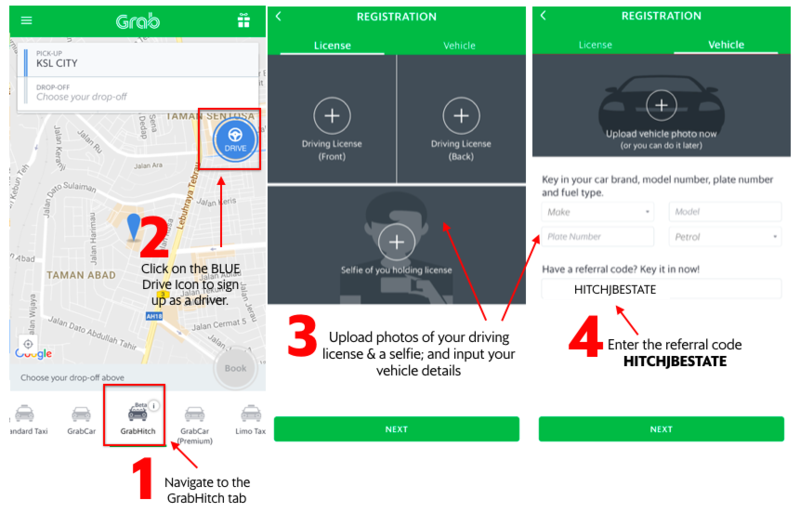 This incentive is only eligible for Insurance Agents who have not signed up with GrabHitch as a driver previously. The REN/REA Registration Number provided needs to tally with the driving license details provided during the driver application process to qualify for the sign up incentive. Please allow 1 – 2 weeks for the crediting of the RM50 incentive into Hitch driver wallets.